Melbourne's Herald Sun newspaper, citing an unnamed source, said the 52-year-old would quit regardless of whether the Socceroos win or lose the two-leg playoff against Honduras. Australia coach Ange Postecoglou passed up the chance to clarify his future in the post on Wednesday after local media reported he would step down after the intercontinental World Cup playoff against Honduras in November. Melbourne's Herald Sun newspaper, citing an unnamed source, said the 52-year-old would quit regardless of whether the Socceroos win or lose the two-leg playoff against the Central Americans. Postecoglou said in a statement issued by Football Federation Australia that he was aware of the report but declined to clarify his coaching position directly. "I am aware of reports today suggesting that I will step down as head coach of the Socceroos next month," he said. "My sole focus is on preparing the team for our final two qualifying matches. "I will not let anything compromise the team’s journey on getting to a fourth consecutive FIFA World Cup." However, FFA chief executive David Gallop suggested the governing body was planning for change after talking to Postecoglou. "Should we qualify, there is a period of some months until the World Cup and we agreed that we will need to lock in our set-up as soon as possible to maximize our preparation time,” Gallop said in the statement. Australia defeated Syria 2-1 after extra time in Sydney on Tuesday to move into the intercontinental playoff for next year's finals in Russia. Postecoglou, who replaced the sacked Holger Osieck in late 2013, had already said he would not continue beyond next year's World Cup and has spoken openly of his desire to coach outside Australia. After coaching the Socceroos at the 2014 World Cup in Brazil, Postecoglou guided the side to its maiden Asian Cup title on home soil the following year. He has been under huge pressure in the final phase of Asian qualifying this year, however, with media pundits and former players regularly criticizing his tactics, selections and insistence on an attacking game. The strain has been particularly evident in recent months, with Postecoglou storming out of a post-match media conference in Melbourne following the team's labored 2-1 win over lightly regarded Thailand in their qualifier. That result was not enough to book an automatic berth to Russia but the coach defiantly dismissed his critics and insisted he would stick to his gameplan, regardless of results. Australia was held to a 1-1 draw in the first leg of its confederation playoff against Syria in Malaysia but two goals from Tim Cahill on Tuesday kept the team's World Cup hopes alive. While a relief for the Socceroos, pundits condemned Postecoglou's move to start playmaker Aaron Mooy on the bench, a decision leaked hours before the game. Midfielder Mooy was the team's best player in Malaysia and was also influential after coming on early in the first half in Sydney to replace the injured Brad Smith. Mooy said after the game that he was "angry" about the decision, a rare criticism from a playing group that had been hitherto vocal in its support of their coach. In another surprising post-match admission, defender Trent Sainsbury said he had not listened to Postecoglou's address in the interval before extra time. "I'm just astounded that people think this is supposed to be easy," Postecoglou said of World Cup qualification after Tuesday's win. 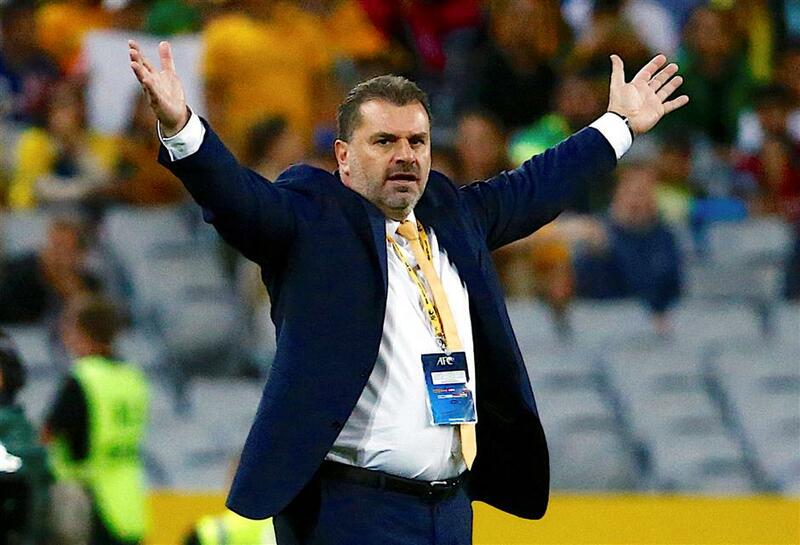 Australia head coach Ange Postecoglou reacts during the World Cup qualifier — the Asian zone playoff, second leg — against Syria at the Olympic Stadium in Sydney on October 10, 2017. Australia won 2-1 after extra-time for an aggregate 3-2 victory which saw it advance to an intercontinental World Cup playoff against Honduras in November.